Introductions / Re: Greetings, once again! I'm relatively new here, so I don't remember you, but welcome back. Reading does help solve all brain-chemistry attacks (at least it did for me hehe, if I'm reading you right), and especially fantasy: as someone once said, 'beware of those who don't read fantasy, for they must find their fantasy elsewhere"
I'm now finally reading The lies of Locke Lamora - I knew zero about it when I started (except that you all guys think it's great hehe), and it's being quite different to what I expected. I'm still around page 50 or so, though. Hmm I'm going to revive this thread because I finished the Black Magician's trilogy last night, and I can't find a thread for that. But does it reveal too much of my soppy side if I say I cried at the end? Fantasy Book & Author Discussion / Re: Most anticipated books of 2014? Gawd, I forgot The Fell Sword, Miles Cameron! Fantasy Book & Author Discussion / Re: Where is Michael Kring? I like how the cover blurb says "to stay one orbit ahead of the interplanetary police" ... surely one orbit takes you back to the same place? You'd want to be half an orbit ahead for maximum separation. Are we getting The Skull Throne in 2014? A. J. Dalton's Tithe of the Saviours. I'm also adding Melanie Rawn's Glassthorns - Thornlost. Fantasy Book & Author Discussion / Re: Fantasy Christmas - What are you asking for? Fantasy Book & Author Discussion / Re: Where and when do you read? I'm like you, about 1 hour in bed before going to sleep. And weekend mornings before getting up. I walk to work, so I can't read during my commute (although I've been tempted hehe). Lately I've actually been more engrossed in books and have been watching less TV, reading a bit when I get home after work instead of going online hehe. Finished A Hundred Thousand Kingdoms and started Awakening - Willian Horwood. Fantasy Book & Author Discussion / Re: What do you look for in a hero? This actually makes perfect sense to me - I tend to be more sympathetic to characters that make the same decisions as I would in those situations (well, not that I even would be in them, but you get the idea ), or at least that don't end up thinking/saying/doing things that just make me go "What? How could you be so stupid?" For those who re-read, how do you find the time and the motivation? I go return a book at the library and I'm like a child in a sweet shop, just can't get enough of new stuff... (not to mention the ones I've recently bought and still haven't read). Writers' Corner / Re: How detailed should character descriptions be? 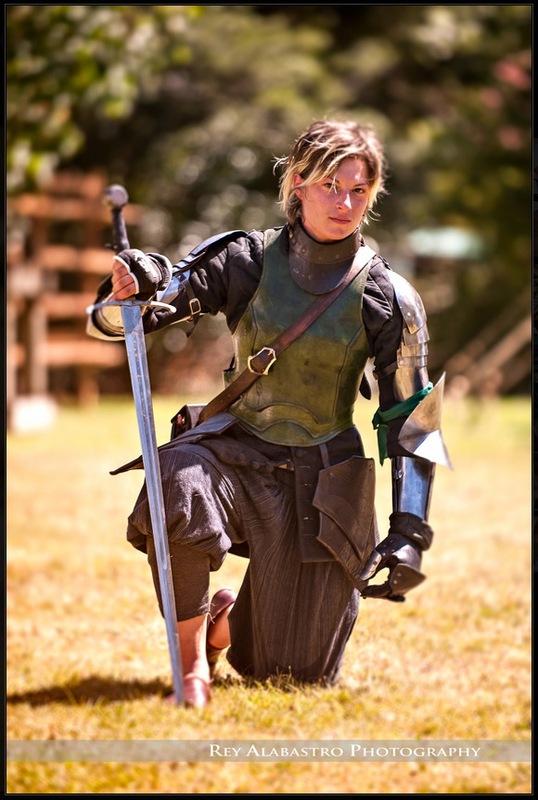 And an actual photo of Samantha Swords who competes and she won the longsword competition in February of this year at the Harcourt Park World Invitational Jousting Tournament. Sorry, but why is he a "mass murdering psychopath"? All he's murdered are demons, never people. Even throughout his invasion of the northern lands, granted, he made basically everyone a slave, but I don't think there was murder, not by him. Jardir is a product of his culture, which can be seen quite clearly not only by his back story but also (for me, even better) via Inevera's back story.